How can one woman make a difference in the world? Using recycled vinyl banners from Whole Foods Market, I made this wearable classic suit and won the "Nickels For Non-Profit Award" for my favorite non-profit art organization, the O'Hanlon Center For the Arts. Now, I am pursuing a NEW body of work, including custom made fabric made from acrylic gel skins. Learn how to grow your career in the arts. From the studio to the gallery and beyond, let me teach you how to build your website, photograph your art and master the game of showing your work in the art gallery. Click here to see my performance, "A Sea Odyssey", 2012 on You Tube. The contemporary art slant in my work is expressed best in this piece called "Sonic Spill", which is comprised of various forms, including spirals, lettuce-edged ruffles called "crenalated forms", and flat Mobius strips, which I knitted and crocheted out of old audiocassete tapes of my first voice lessons in my singing career. This piece is about the pollution of the oceans by oil slicks, and the various industrial materials that are mucking up our environment. "Breaking Through", a classic shell dress made like a crazy quilt out of viny and eggshell mosaic, was born after I investigated the sound of the Velcro rippng away from the vinyl. As a musician, I create wearable arts that are as much about sound as they are about the visual form. Early in the making of "Breaking Through", my life as a raw foodist and concern for chickens liviing in battery cages eventually grew into my desire to "break free" from my own personal history of growing up "walking on eggshells". To express the "sweltering" conditions of not being able to speak around someone suffering from the mental disorder called Borderline Personality Disorder, I chose the vinyl as a foundation for the eggshells because it is unbearable to wear. I wore this piece for my performance called "Breaking Through", on the hottest day of the year in June 2008, when temperatures soared at 106 degrees. As a singer, I usually tell my story through rhyme on pitch, but for this piece, I was silent throughout the 7 minute long performance, while playing Beethoven's 5th Symphony, on an air piano, with the accompanying snapping and crackling of the vinyl and eggshells, which spoke for me. At the end of my performance, I dismantled the dress, crazy patch by crazy patch, starting with the 5 sided upside down pentagon over my heart, and left it in a pile behind me. Now, "Breaking Through", has made its rounds through the galleries in the Bay Area for 3 years, and has been permanently retired as a reminder that I can speak for myself! My desire to heal myself moved into my deep concern for Mother Earth. I took an interest in working with bubblewrap, after I learned through my research that the glue used in the manufacturing process of the air pockets deems it not recyclable. It is classified as a "reusable" material and only avoids the landfill if people reuse it. 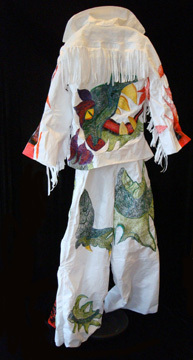 As I found my voice, after "breaking through", I realized that I can create my "costumes" and wear them as a "podium" for educating the public about the true nature of plastic and its impact on our health and environment. My Juki industrial sewing machine met its match with this Elvis 70's-styled jump suit created with heat-fused Glad trash bags and Home Depot bags, used for the orange gussets, then adorned with a Chinese Dragon, made with custom appliques and thousands of yards of machine embroidery thread.